Wow, am I happy to be on the other side of the polar vortex of last week. Not only the weather, but also an untimely bout of food poisoning, led me to cancel or postpone all my classes last week. I’m very sorry if this was an inconvenience to you. I always do an extra happy dance when we reach early February because this means that we’ve made it through the 3 darkest months of the year. Woo-hoo! I am feeling the very beginnings of spring stirring within me. Despite the faint glimmer of spring, I know so many people who are getting worn down, who find it difficult to be hopeful about our future. I know I am often asking myself if what I am doing is making a difference. There is so much to be done – how can I have the most significant impact? I’m entering into this year with renewed curiosity about how we are collectively capable of much more than we can imagine. In early January my teacher Master Chunyi Lin led a free week-long global healing mediation to bless the New Year. He repeatedly encouraged us by giving examples of how collective meditation has measurably reduced crime rates. I had heard some of these benefits of collective meditation before, but it stood out to me this year as gun control and stopping police violence on black and brown bodies seem to be going nowhere. Many rallying cries for action on gun violence have been calling out politicians for their superficial “hopes and prayers” for the victims. I agree, action is urgently needed. But what if our prayers matter? What if they could significantly reduce violence and hatred in our community? Many of us have personal experiences of prayer and spiritual practice making a real difference in our lives. I felt the difference for myself the two times I had cancer. The first time I was anxious all the time and had difficulty sleeping. The second time I was three years deeper into my qigong practice and was having very enlightening experiences with my qigong healers. Sleep was easy and I had fewer side effects. With that experience I felt like I really got how complementary medicine enhances and strengthens the treatments from my Western doctors. Moving from the personal to the collective, our prayers are a powerful complement to public policy. Organizations such as Unify sponsor global meditations with exactly this intention. Their website includes a short video on the Science of Peace featuring Dr. John Hagelin, a quantum physicist. This is not the physics of my Newton-loving physicist father, but I find it interesting nonetheless. Hagelin describes how when people tap into the oneness through meditation, they are not unlike stereo speakers, each giving off a vibration of consciousness. With each additional speaker the intensity of the vibration is squared. If you have a stereo with two speakers operating monophonically and in close proximity the sound is four times louder than if there is just one speaker. If there are three speakers the sound is nine times louder. With more speakers in synch with each other in close proximity you can create an enormous sound. The idea with collective meditation is that there is a similar effect. When 10 people practice together the energetic field of their meditation is 100 times stronger than a solo meditation. This is partly why it is often easier to go deeper more quickly in group meditation. If you want maximum personal benefit for your spiritual practice, practice with others. If you want your prayers for others and for the earth to have maximum impact, meditate with others. And yet, this is so much easier said than done. I’m overcoming years of cultural conditioning that has made me think that needing a group is a form of weakness and that groups are not a safe space to be weak. Learning the science of collective meditation is one more help in disentangling myself from this painfully individualist way of being. I’m also overcoming years of cultural conditioning that things are only real if you can write them down or measure them. In this mindset our impact can only be valued by activity, policies, and statistics. Again, this science of collective meditation helps me expand how I understand I can make a difference. I also have years of cultural conditioning that makes me suspicious of metaphysical quantum physicists that I can barely understand. Maybe that’s up for you as well and Hagelin isn’t you man. Please stay curious with me the power of collective practice anyway. 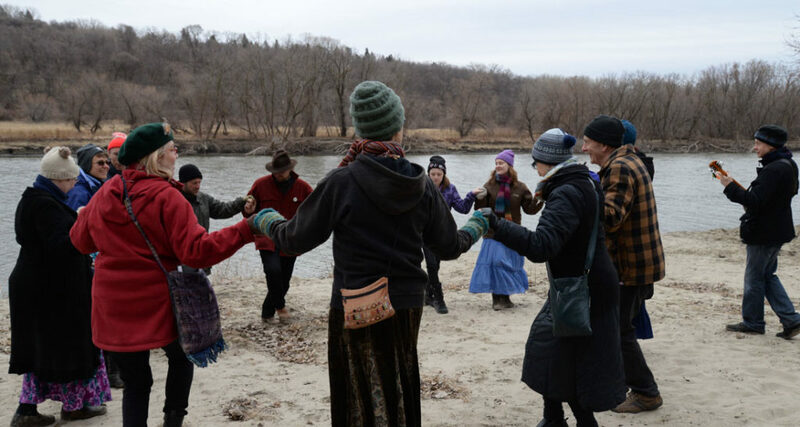 Drop-ins are welcome any week to the Healing Waters Qigong practice group (based in Spring Forest Qigong) and Wisdom Dances dance circle, based in Laura Shannon’s research on traditional dances as tools for healing and transformation. Join in the ancient tradition of dancing to help the world come alive in spring. With live music by Greg Herriges and the Wisdom Dancers. Saturday March 23, 2019. Learn more.